Think you know the Toyota Yaris? Think again – as Toyota brings an all-new, bolder Yaris Sedan to Canada. The new 2016 Toyota Yaris Sedan is more than just a new car with a familiar name. Responding to the needs and desires of Canadian drivers, this new premium subcompact brings upscale features, dynamic handling, and fresh styling to an efficient vehicle that’s popular in a market segment that Canadians love. Take one look, and the Yaris Sedan impresses with a striking profile that stands out from the crowd. Up front, the bold new face of Yaris features sharp-eyed headlights and a hexagon lower grille, while a spacious trunk gives the rear a distinctive look. Premium details abound – from the piano black bumpers, to the chrome grille surround and tailpipe, to the power-adjustable heated exterior mirrors, to the keyless entry offered as standard on all models. Open the door and slip behind the sporty steering wheel, and admire the surprisingly roomy cabin filled with premium amenities. Steering wheel mounted switches put audio and Bluetooth controls within easy reach, while the available Display Audio System features a seven-inch touch screen, six speakers, two USB audio inputs, and an Auxiliary audio jack. Available amenities include an upgraded multimedia system with voice recognition controls and a back-up camera. The Yaris Sedan is standard equipped with an impressive list of features – including cruise control, power windows and power door locks – all set off with chrome accents and the soft-touch trim and surfaces one expects from a premium sport sedan. The trunk is spacious, and made even more versatile thanks to a standard 60/40 split folding rear seat. If the style promises fun, the performance delivers. Hit the Push Button Start and Yaris Sedan’s high-spirited, 106 horsepower, 1.5L four-cylinder engine comes to life with a sporty yet muted rasp. The Yaris Sedan is offered with a choice of compact and lightweight six-speed manual or six-speed automatic transmissions: The manual transmission features a short stroke for quick shifting while the available automatic transmission with lock-up torque converter delivers a direct-shift feel and impressive efficiency, plus a Sport Mode feature that boosts torque for more spirited driving. 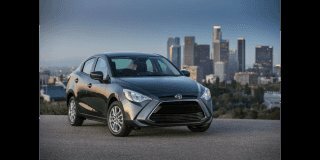 To squeeze the most out of this drive train, Toyota designed agility into the Yaris Sedan with a highly-rigid body structure enhanced with front and rear suspensions that strike a balance between sporty handling and ride comfort. Toyota engineers then added steering and braking systems carefully tuned to deliver the handling worthy of a sport sedan. And because the Yaris Sedan is a Toyota, it’s also the subcompact that’s big on safety, featuring active and passive systems that work together to keep driver and occupants safe. The 2016 Toyota Yaris Sedan arrives at Toyota Dealers across Canada later this year. More details, including additional specifications and pricing, will be available closer to the on-sale date.